Antibiotic Stewardship in Nursing Homes. To guide these improvements, CDC released a new resource: Core Elements of Antibiotic Stewardship for Nursing Homes. 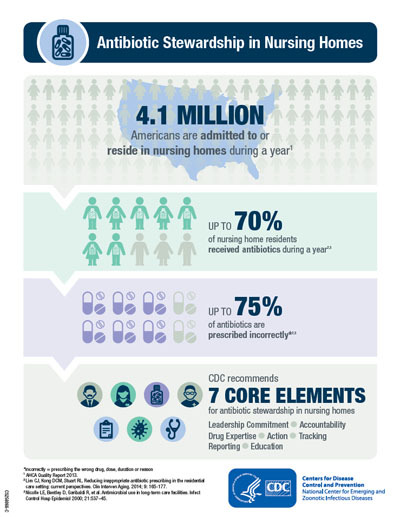 The Core Elements for Nursing Homes expand upon CDC’s recommendation last year that all acute care hospitals implement an antibiotic stewardship program designed to optimize treatment of infections while reducing adverse events associated with antibiotic use. “Nursing homes that engage in antibiotic stewardship improve care for residents and help reduce antibiotic resistance,” said Patrick Conway, M.D., M.Sc., CMS deputy administrator for innovation and quality & CMS chief medical officer. The release of CDC’s Core Elements for Nursing Homes is one step in achieving the objectives set out in the National Action Plan for Combating Antibiotic-resistant Bacteria. Investments to improve antibiotic stewardship across all settings are part of CDC’s Antibiotic Resistance Solutions Initiative for fiscal year 2016.